For this felted bag, I wanted to create a structured base for highlighting a two-coloured houndstooth fair isle pattern. The strap features a wide shoulder band and two icord straps for durability, and is worked with short rows for a tailored shape. If you haven’t yet worked fair isle, this is a great first project. The chart is small and easy to follow. If you have any issues with tension, the felting process will make everything look perfectly aligned. Approximately 250 yards each of two colours. 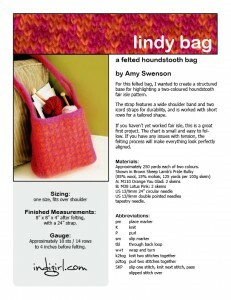 To see more projects and information about Lindy Bag, visit Ravelry.